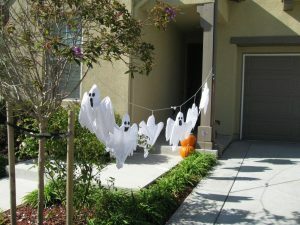 It was Ghostly (see house decorated w/ ghosts) Â good fun at Merimont at the 2nd annual homeowner Halloween party! Halloween was bright and sunshinyÂ – a perfect day for children and parents alike to gather and enjoy each other and community spirit at Merimont as the newest homeowners bonded with those whoâ€™ve been here for awhile! Monstrous fun was had by all as the kids enjoyed a jumpy house, pumpkin painting, face painting , fishing for prizes, and wagon rides too! And for everyone there were spooky treats and drinks that mom and dad enjoyed too! The final phase at Merimont in San Bruno is coming soon.